Libyan Protestors in Benghazi city. For several weeks I’ve resisted the temptation to blog on groundswell of popular protest rocketing across the Middle East. In part, my hesitation was driven by the expansive coverage already offered by some of the best bloggers on the internet: Daniel Drezner, David Rothkopf, Duncan Green, Gideon Rachman, and Stephen Walt have all blogged on events in recent days. In part, my hesitation was also driven by the excellent coverage offered by the Daily Show in recent days as well. But recent events in Libya, where Moammar Gadhafi, who has been in power for more than 40 years, has been engaged in a desperate struggle to put down popular protests by ordinary Libyans demanding democratization—and more specifically a recent blog post by political scientist Benjamin Barber—sparked my curiosity. Benjamin Barber is probably already well-known to most readers of this blog. His work on democratic politics (strong vs. thin democracy) as well as his work on globalization (Jihad vs. McWorld) make him a staple in most comparative politics and international relations programs. Writing at the Huffington Post last week, Barber made the case that whether or not Gadhafi is able to hold on to power Libya will likely face ongoing domestic turmoil—if not outright civil war—rather than the establishment of a democratic polis. In Egypt, despite the success of popular protests in forcing the resignation of President Hosni Mubarak, there is similar reason to suspect that the democratic hopes of the masses will be dashed. Remember that it was the military that assumed control of the Egyptian government following Mubarak’s resignation, despite constitutional provisions that his successor should have been the head of the Egyptian parliament. The military is promising elections in September, but that remains months away. And even if democratic elections are held in countries like Egypt, we still have to be aware of the limits of elections as a proxy for democracy. Real democracy—strong democracy, in Barber’s terms—requires more than elections. As Barber notes, the notion of radical individualism that lies at the heart of liberal political theory produces a limited form of democracy which negates the idea of community central to real (or strong) democracy. For Barber, then, it is the excess of liberalism that undermines democratic structures in the west and facilities cynicism and alienation. The popular protests taking place across the Middle East in recent weeks is a sign of the strength of civil society in these countries. 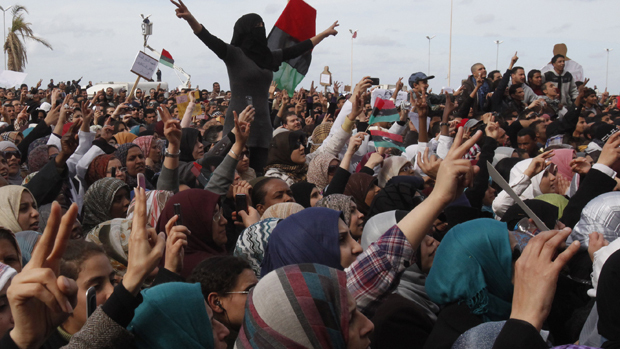 Despite decades of suppression, civil society in these countries is proving its vitality. Translating the strength of the popular protests into a democratic polis will clearly be a major challenge for the countries of the Middle East in the near future. Clearly there is reason for doubt. But there’s also reason for hope. Every now and then, an event comes along which exemplifies perfectly a concept in international politics. Last week the city of Lucca, Italy, enacted a ban on non-Italian restaurants operating in the city center. According to a widely circulated report, the new ban was intended to “protect” local specialties from the rising popularity of “different” (read: foreign) cuisines. The measure also bans fast food restaurants and hopes to reduce littering within the city’s ancient walls, a magnet for tourists. According to city spokesperson Massimo Di Grazia, “By ethnic cuisine we mean a different cuisine…That means no new kebabs, Thai or Lebanese restaurants.” It certainly means no McDonald’s or Pizza Huts as well. A chorus of critics immediately raised concerns of “culinary racism.” And the city did itself no favors when Di Grazia attempted to clarify the ban, stating that while it was unclear how “different” a restaurant would have to be to fall under the terms of the ban, a hypothetical French restaurant would be allowed to open but restaurants using “Middle Eastern ingredients” probably would not. As a phenomenon, globalization is nothing new. Marco Polo’s journey to China was but an early step in the process of increasing economic and cultural interconnections between countries and regions. Ironically, Italian cuisine itself is the product of globalization. Prior to the Columbian exchange in the early 1500s, there were no tomatoes in Italy. It may be hard to imagine Italian food without tomato sauce, but prior to the 16th century, tomatoes were not part of the Italian diet. Nevertheless, the increasing intensity of globalization today often sparks sharp responses. Recall the purchase of American brewer Anheuser-Busch by the Belgian brewer In-Bev, which led to proposals to boycott Budweiser and “drink American.” Political scientist Benjamin Barber analyzed the effects of globalization and cultural resistance in his seminal article “Jihad vs. McWorld,” which has increasingly become a must-read article for those interested in the topic. Barber noted that responses to globalization often involve a strong affirmation of local identity-based politics, sometimes leading to increasing tensions. In this sense, Lucca’s ban on foreign foods represents just another attempt to stem the tide of globalization.